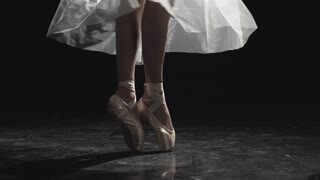 A young ballet dancer in white and a 20s attractive ballerina in black dress dance in a white dance hall next to a large white window, close-up 4k. silhouette of ballerina in classical tutu in the white studio. Close up of ballet dancer as she practices exercises on dark stage or studio. Woman's feet in pointe shoes. Ballerina shows classic ballet pas. Slow motion. Flare, gimbal shot. 4k, view from under the bed. someone strips a woman and throws her underwear on the floor next to the bed.